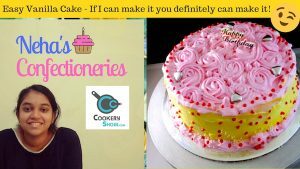 This is an simple and easy Vanilla Cake Recipe which everyone can try at your home. It’s juicy, tender and full of vanilla flavour. The buttery, moist texture makes it a great cake for all occasions. The process is easy to remember which makes this simple vanilla cake easy to make. Whip up this cake the next time you have a craving and I promise you won’t be disappointed! Mix all ingredients listed above for making cake base. Grease baking tray with cooking oil. Bake for 40 minutes in 180-degree celsius. Allow the cake to cool. Meanwhile, beat mactop cream with vanilla extract and make whipping cream. Then prepare sugar syrup by dissolving sugar in water. Once the cake is cooled well, cut cake into layers. Brush it with sugar syrup. Then cover each piece of cake with whipping cream. 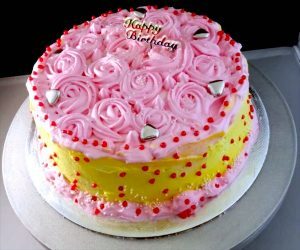 Add some food colour to whipping cream and make flowers on the cake. Decorate it with pearl drops. That's it, the yummy Vanilla Birthday Cake is ready to serve.